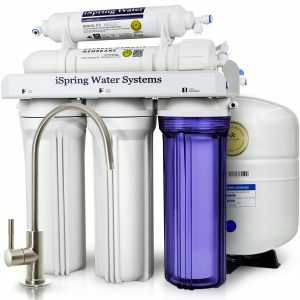 Buying iSpring Reverse Osmosis Water Filter? This Is Better..
iSpring reverse osmosis water filters received tremendous reviews from it’s existing customer, especially on the iSpring RCC7. 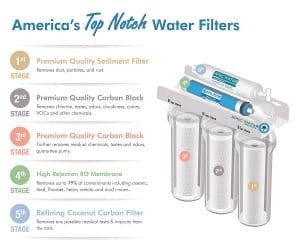 It is the best seller water filters from iSpring and number one water filter in Amazon. Since it is such a great system as rated by it’s customer, why would we recommend others? Which system is better than the iSpring system? Let’s take iSpring RCC7 as a subject of comparison. Which Is Better Than iSpring RCC7? You might have known which system that we are recommending. The recommended water filter system in contrast with iSpring RCC7 is the one and only APEC ROES-50. Similarly, to iSpring RCC7, APEC ROES-50 receive excellent customer reviews on the product quality and its functionality. Both systems are considered the entry model for reverse osmosis water filter system. What makes us favor the APEC ROES-50? It’s Better in Filter Quality.. Although iSpring receive a WQA Gold Seal Certification, APEC ROES-50 is still a preferred model by most of the people. 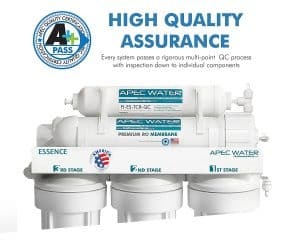 APEC is guaranteed to remove the following item with their reverse osmosis system. In addition, the APEC ROES-50 is able to handle a much-contaminated water as compare to the iSpring RCC7. The max TDS that can be handled by iSpring RCC7 is only half of the amount of the APEC ROES-50. It is not quite suitable to install the iSpring RCC7 on a private well water source. The filter quality of APEC is way better than iSpring. 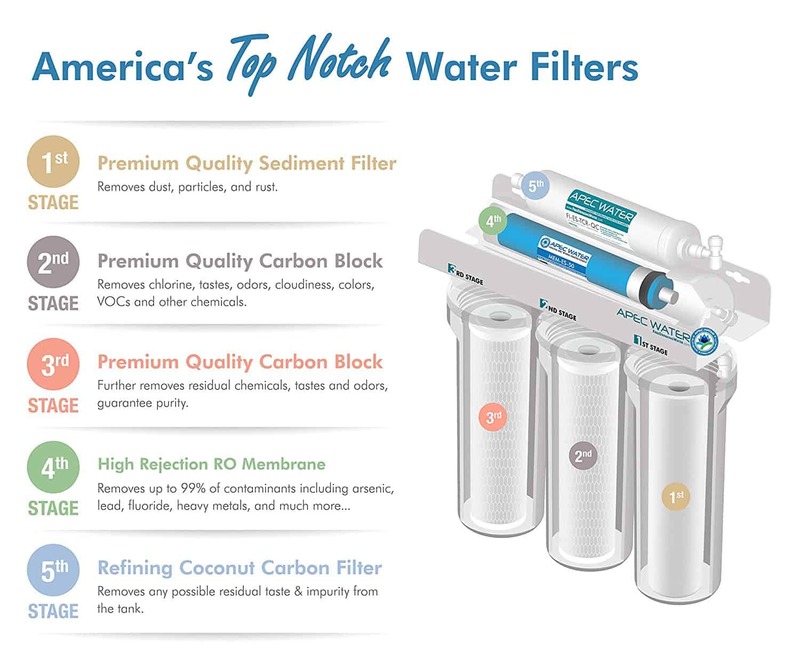 Based on the filtration lifespan, APEC is able handle twice the amount of contamination within a single filter. This means that it is able to withstand more contamination while still maintain the quality of the filtered water. With less frequent maintenance required, the annual maintenance cost of APEC ROES-50 is much lesser as compared to iSpring RCC7. Most of us prefer our products to be made in US. If it is possible, we won’t be buying products from other countries due to quality purposes. Although iSpring doesn’t have much quality issue, the RCC7 is only designed in the US but was not made and assemble in the US. On the other hand, the APEC ROES-50 is fully design and assemble in the US. iSpring reverse osmosis RCC7 is not that bad after all. It is just not as good as the APEC ROES-50. We have talked about the pros of the APEC ROES-50, let’s see what are the advantages of iSpring RCC7 compared to APEC ROES-50. The initial investment for iSpring RCC7 is slightly lower compared to APEC ROES-50. One of the main reason is that it is not made in the US. Hence the overall cost will be lower as compared to APEC. Flow rate for iSpring RCC7 can topped at 75GPD on an optimum temperature and pressure while APEC ROES-50 can only achieve 50GPD. However, APEC ROES-50 has a slightly larger storage tank which can cope on the normal demand of water. Looking at the advantages and disadvantages from both systems, do you feel that the APEC ROES-50 is a better choice compare to iSpring RCC7? Let us know what do you think about our comparison of both best sellers in town. Thanks for the post Jay! I appreciate this post as I was looking very closely at getting one of these exact filters. But I did wonder about the durability? I could not find much on the durability anywhere or in this review and just wondered if you had an additional knowledge to offer on how it would cope under rain, sun and possible wear and tear. iSpring and APEC water filter generally has a great durability. They have fewer complaints on leaking overall. As the water filter system is not install outside the house, hence the outer canister casing is able to withstand for more than 5 years. I myself like my water to be clean and I’ve been looking at different filtration systems. I drink a lot of water. There is too much garbage in the water these days for any type of use and regular small filters don’t really get the job done. Also, do you have any recommendations for shower filters? That’s something I’ve been looking into as well.